When Norwegian architects Snøhetta were invited to compete for a new museum at France’s world-renowned cave painting site Lascaux, founding partner Kjetil Thorsen admits to being ‘a bit frightened’. But this cocktail of fear and respect paid off, because the firm pipped Jean Nouvel (among others) to the post. This must have been galling for the Frenchman, as he was born nearby in 1945, just five years after the paintings were discovered, outside the town of Montignac, in the Dordogne. The Lascaux cave paintings, which date back around 20,000 years, are nicknamed the Sistine Chapel of prehistory. They have been closed to the public since 1963 to protect them, so a copy was constructed nearby in the early 1980s as a mock-up experience for visitors. However, it is now deemed too close to the original site. Snøhetta’s new International Cave Art Centre opened in December 2016, on a piece of nearby farmland framed by a wooded hillside. Thorsen likens the centre to ‘an incision in the landscape where you pull up the landscape and look under it’. Inside, the inclined walls have random horizontal stripes sandblasted into them, to suggest geological layers. By embedding the building in the land, Thorsen has been able to play with scale. ‘We design big buildings to look slightly smaller [than they are] so you get a surprise with the internal space,’ he says. For Lascaux, he created a shallow glass-fronted foyer, behind which there are ever deeper and darker exhibition spaces. The €57m venue, commissioned by the Conseil Général de la Dordogne, must fulfil a number of roles. Hence the six gallery zones created by London exhibition specialists Casson Mann to answer, ‘as far as possible, the questions that visitors have after seeing Lascaux’, says co-founder Dinah Casson. But the big draw is an exact replica of the original caves, reached by leaving the building and walking up the sloped roof to another entrance. This is a reference to the way four local boys and a dog originally discovered them in the 1940s – through a hole in the ground. 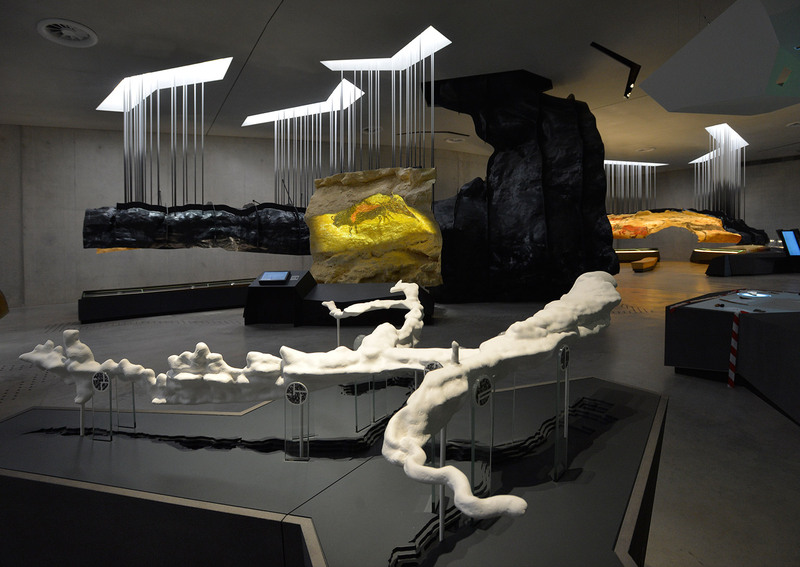 The cave environment and its artworks were painstakingly recreated over four years at the Atelier des Fac-Similés du Périgord by 30 artists specialising in Palaeolithic techniques. To add to the cave-like ambience, the temperature is set at 12°C and humidity at 80 per cent. Dinah Casson points out that a lot of the museum’s visitors will be holidaymakers on the hunt for something to do in bad weather, but the venue will also appeal to people with a genuine interest in Palaeolithic art. And as one of Snøhetta’s very few French buildings, it might even become a destination for fans of the Norwegians’ work.